Coverage: Watch highlights on BBC Two, the BBC Sport website and app. Live commentary on the best matches on BBC Radio 5 live, 5 live sports extra and online. 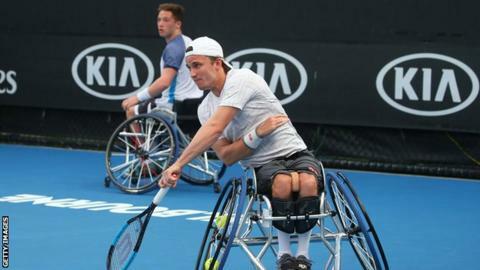 British top seeds Gordon Reid and Alfie Hewett battled through three sets to reach the men's wheelchair doubles final at the Australian Open. The reigning US Open and Wimbledon champions came through 6-1 4-6 10-6 against Argentina's Gustavo Fernandez and Japan's Shingo Kunieda. They face French second seeds Stephane Houdet and Nicolas Peifer on Friday - a replay of the Wimbledon final. Fellow Britons Andy Lapthorne and Lucy Shuker suffered defeats on Thursday. Lapthorne, playing alongside America's David Wagner, missed out on the quad doubles title against Australians Dylan Alcott and Heath Davidson, who won 6-0 6-7 (5-7) 10-6. Three-time Olympic medallist Lapthorne also lost in straight sets to Davidson 6-2 6-1 in his second round-robin match in the quad singles. Shuker and South Africa's Kgothatso Montjane were beaten 6-1 6-3 in the women's wheelchair doubles semi-final by Dutchwoman Marjolein Buis and Japan's Yui Kamiji.